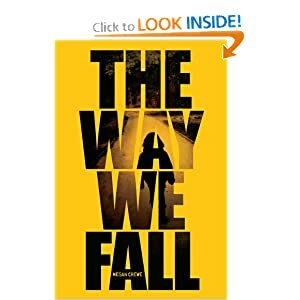 The Way We Fall by Megan Crewe is a pretty darn good read. Kaelyn, the main character, lives with her family on an island. The book is written as a journal or diary of sorts from Kaelyn to her former best friend who is no longer living on the island. Kaelyn is trying to make some positive life changes and open up a bit more when a virus hits the island. You follow the story as Kaelyn’s world falls apart. You feel her hope and her despair along the way. It is definitely a worthwhile read. It could have been better. There could have been a little more attention to some of the details. Certain aspects of the story could have been a bit more dramatic. It felt a bit like Ms. Crewe was holding back a bit, perhaps for the sake of the intended audience (teens). But that holding back took a bit of the excitement out of the book. I felt the love interest in the book was a little bit forced. Who gets a boyfriend when everyone is dropping dead from a virus? The characters were well developed. The story felt complete. I liked it. Parental blurb since this is young adult fiction- violence, but not as graphic as it could have been. Some cursing. Mentions of homosexuality. That’s about it. I don’t have a recommended age, because that would really be up to you on this one.